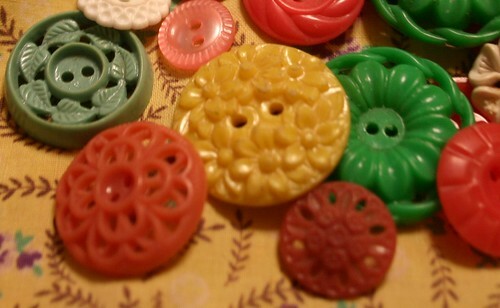 finding a jar of vintage buttons shaped like flowers while stopping at an antique mall i spotted when driving home from portland (especially finding pink vintage buttons that look like flowers...my favorite...though the yellow one above is perfection in vintage button world...at least to me...and that green one is pretty fantastic...and the light blue one is...oh i just love them all). sitting on the couch with millie curled up against me keeping me warm. twirling around the house after receiving some exciting news. continuing to fill up my soul with the blue sky and sunshine we have had for four days in a row. allowing myself to sit in the quiet and dream about all that the future holds, then taking a deep breath a deciding to just jump in. right now. please share your five (really) good things.